A new report by the Global Business Travel Association (GBTA) Foundation, in partnership with American Express Global Business Travel (GBT), highlights the positive economic impact business travel has on the nation’s economy. “The U.S. Business Travel Economic Impact Report” revealed that business travel was responsible for about 3% ($547 billion) of U.S. GDP in 2016. Additionally, the research found that for every 1% change in business travel spending, the U.S. economy gains or loses 74,000 jobs, $5.5 billion in GDP, $3.3 billion in wages, and $1.3 billion in taxes, according to the report. 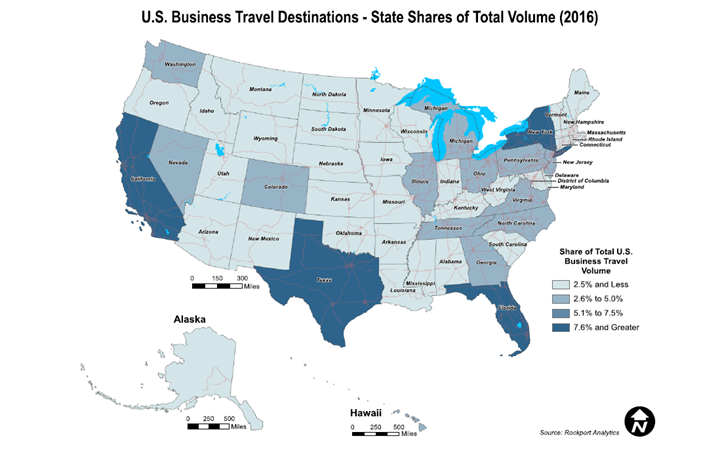 The report found that U.S. businesses spent $424 billion to send travelers out on the road for 514.4 million domestic business trips in 2016. The business travel industry supports 7.4 million jobs and generated $135 billion in federal, state, and local taxes, according to GBTA. Much of business travel’s contribution to the economy accrues directly to industries that serve business travelers, but their supply chain beneficiaries received an additional indirect contribution of $132 billion. In 2016, the average amount spent per business fell 2.2% to $520, including $163 on lodging, $180 on transportation, $94 on food and beverages in restaurants, $33 on entertainment, and $50 on shopping and merchandise, according to the report. These averages include both domestic and international inbound trips, as well as both day and overnight trips. Roughly half (48%) of U.S. business trips were taken for transient purposes (sales trips, client services, government and military travel, and travel for construction or repair), while 28% were taken for group travel purposes. A personal car or truck (35%) was the most popular mode of transportation among U.S. business travelers in 2016, followed by airplane (28%) and rental cars (13%), according to the report.